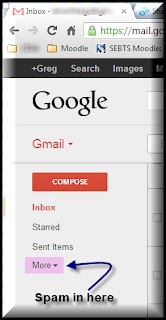 I thought it might be fun to share a little tip with you that could help you organize and manage your Gmail in order to increase efficiency. The idea is that we are generally only interested in our email when there is something new that shows up and we have not read it yet. I have come to really enjoy the small number in parentheses next to my label - or folder - that indicates how many new or unread messages are there. That being said - I don't think anyone really likes spam. Nonetheless, it is important to check it to ensure that there isn't something in there that does not belong there. 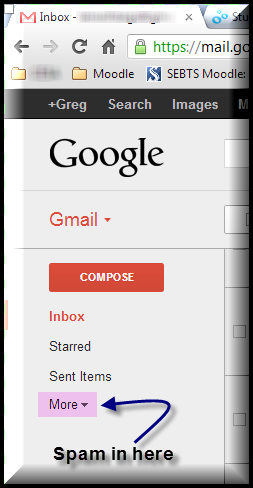 By default the "spam folder" or label is tucked away under the 'more' section. If you constantly have to click on the more section to see if there is anything in your spam folder, that is just plain old inefficient. Here is a fun trick to automatically have the Spam folder show up only when there is something new that shows up. Now - keep in mind as we look at this that you can apply the same settings to more than just the spam folder so this can be a great way to organize and manage your inbox and avoid unneeded checking. The result will be that you can keep a clean-looking collapsed view as shown in Figure 1 and continue to have a clean collapsed view as new messages show up in spam or other folders that you place the setting on. Figure 4: Locate settings under the 'gear icon"
Figure 3 shows the collapsed view with the addition of the spam folder after something showed up in there. Here is how you set it up. 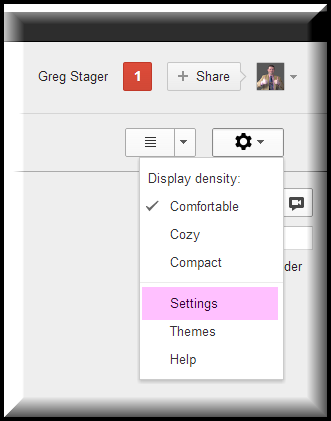 First of all, you will need to access your Gmail settings (see Figure 4). This will take you to the settings area where you can then look for the Labels tab. By default, you will land on the General tab. The Labels tab should be the one right next to it (see Figure 5). Once on the Labels tab, you can look at all of the labels that you currently have. There are three options but not every label will have all three available. You can choose to show, hide, or show if unread for them. In Figure 5, you see that Spam has the option to show if there are unread items. this is handy to keep that folder out of the way unless something is routed there and you don't have to keep checking it all the time. You could opt to simply show it full time by selecting 'show' but that would be a personal preference. 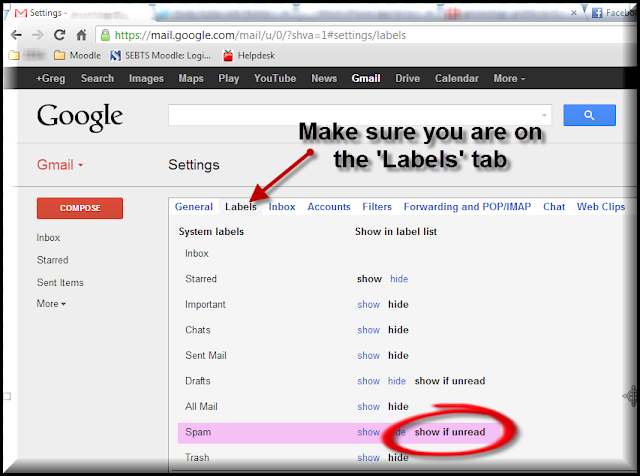 At any rate, I hope that you found this to be a useful tip for organizing and managing your Gmail interface.